I love this fabric (which I’m surprised I haven’t seen more of in blogs?) and I love the way this quilt came together. The fabric is City Weekend by Oliver + S for Moda and the pattern is the Swirly Pop pattern. This quilt came just in time for a snowy white out kind of day. Have a good weekend! That is happy and bright. Love it. Very cute! I have some of that but just haven't fit it into my queue!! Maybe next! Makes me smile, it's so lovely. Oh I love it! I have a couple of charm packs of this and I wasn't sure if they'd work with white, but it looks awesome! I know! The colors in this line are amazing! and it looks perfect in this pattern. 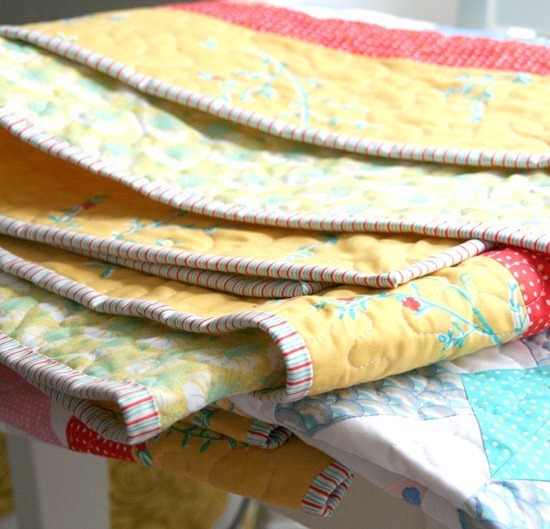 I love this fabric and this quilt is just adorable! It's beautiful, I think people who can quilt are gifted artists. I just picked up a little fabric from that line! I love the colors. 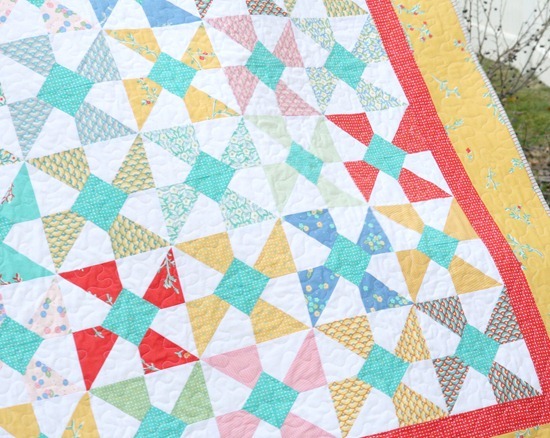 Your quilt pattern is on my list of projects that are partly cut out! It looks great in those fabrics!! Love your quilt, beautifully fresh looking! A pack of 'city weekend' charm squares was the first ever charm squares I ever bought, I'd never even heard of charm squares before. I made a small and a larger patched cushion and used some for enhancing other sewing items! I love the binding! What size strips did you use? It looks wider than 2 1/2 inches. it is happy and bright… Love it! Certainly is properly named….too cute! Fun quilt in fun fabric! That red border really pops! Very pretty fabric. I Have a lovely little stack of FQ's in these fabrics and absolutely adore the combination together! I can't wait to throw a fun little quilt together with it! Love the quilt! Pinwheels always make me giggle! And that is a great fabric. I love a stripe binding! Wow, thanks for showing the potential of this collection. I do stare at it each time I visit my local fabric boutique but dont really "see" it. I love it too and now have to look for that fabric. Why do they keep making pretty fabric! 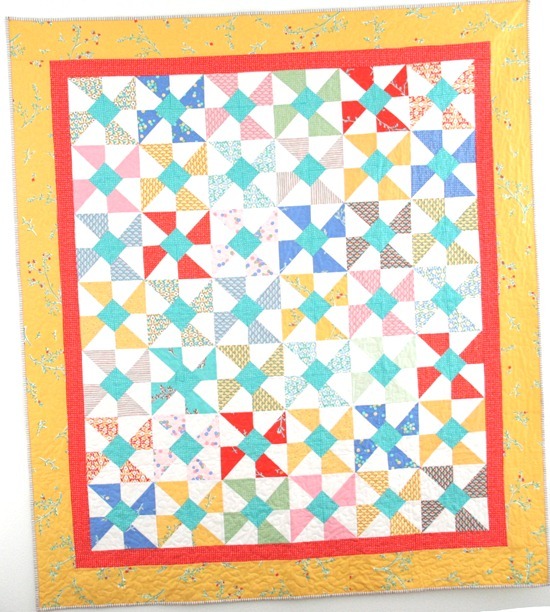 I love the cheerful colors in your quilt! That is bright and happy fabric….I love the mustard color! And of course your striped binding is sweet!